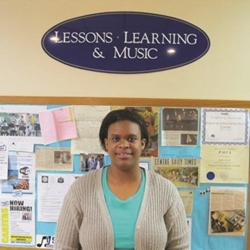 Brandy has been teaching private lessons for roughly 11 years, and has been with Robert M. Sides since 2006. She graduated from Penn State with a B.S. in Music Education, and currently performs with the Nittany Valley Symphony, State College Municipal Band, Bavarian Stompers, and State College Community Theatre pit orchestras. Past performances have been with the Altoona Symphony, Pennsylvania Centre Orchestra, Nittany Wind Quintet, Altoona Community Theatre, Penn State Centre Stage, P&J Productions, Singing Onstage Studios, Little German Band, and Repasz Band. She was also a guest clarinet soloist with the Elementary Honors Choir at an American Choral Directors Association conference.